Looking through the doors of the not-quite-ready North Albany IGA on Saturday, March 31. The company preparing to open the North Albany IGA supermarket — long awaited by many North Albany residents — has been quiet about the opening date, but the word downtown is that it will be April 18. Downtown? Yes, at the downtown liquor store, which has been licensed to The Myers Group of Clinton, Wash., since last year. 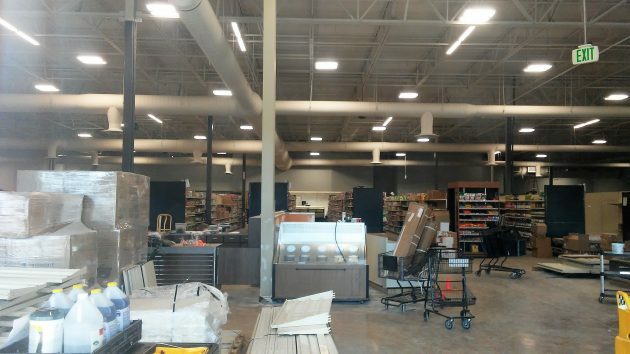 That’s the company that’s been working since early 2017 to get the new supermarket ready to open at the North Albany Village shopping center. As I reported when the OLCC transferred the store’s license to the new operator in August, the downtown liquor outlet will move to a spot inside the supermarket. Albany City Manager Peter Troedsson reported the market’s apparent opening date to the city council in his regular Friday summary of noteworthy items. How did he know? Hoping to confirm the date, I texted Tyler Myers, president of the Washington-based chain of groceries and other stores. But he didn’t respond in time for this story. Moving more like a herd of frantic turtles I’d say. Is this crew related to those resting on their collective shovels fiddle farting around getting the down town put back together??!! It’s a matter of rotten tomato’s that there will be a “garden store” associated with the ACE Hardware. Kind of a shame as the very close by Tom’s has done so much to build up their area & provide great service. Has H. H. forgotten the grief caused to Tom when that seasonal garden shop opened up on the old Safeway lot….with NO license/permits several years before he moved to N. Albany!! Too much competition isn’t always a good thing. Ace doesn’t have a thing over Home Depot! If you want really good reasonably priced hardware try McDonalds on 1st st. just west of the truck eating railroad trestle. Yup HD has lots of stuff. It’s close to what I need, but falls short because they only carry what sells in volume. Spoiled by Coast-to-Coast and Western Auto , then Ace and True Value. I remember asking at McDonald if there was a real hardware in Albany (when they were basically nuts/bolts/fasteners) and getting a head shake. They’re trying and worth a look.